As promised, here's one of my looks from this month's Matchbook Magazine feature and it's probably, hands down, one of my favorite. Not only am I just a sucker for peplum tops and bold printed pants, but Wes Sumner captured some unbelievable sunset light in these photos, no? I love peplum tops and bottoms. Love your styling! I love the peplum trend! Looking good as always! beautiful!!! I love this whole outfit! 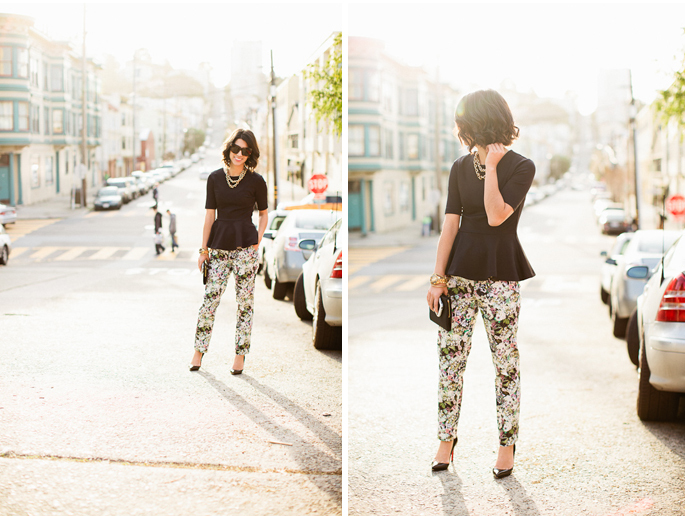 Love love love those Zara floral pants! I must agree I'm such a sucker fro peplum tops and this outfit is just fabulous! The light that has been captured is also just perfect! This outfit couldn't be more perfect - love the floral print, peplum, pointed pumps & gold accents...just beautiful!! this is so precious. 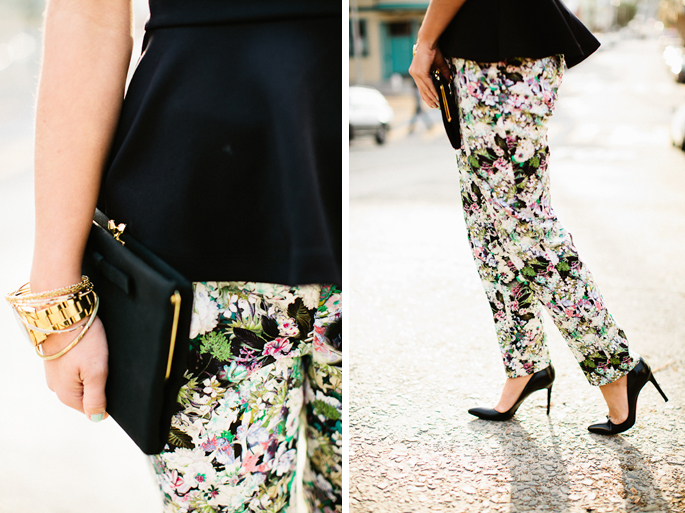 i love a good floral pant, but i'm too scared to try it myself. nice touch of added whimsy in the peplum! these really are gorgeous photos! i prefer the peplum skirt to shirt, but this one works! Aww, I have the same trousers! Adore how you paired it with the peplum. So on trend. And spectacular lighting! This peplum top could not be cuter! I love it! Especially paired with the floral pants! And those sunnies are adorable, I've been eyeing them for the last little while, they're so fun! 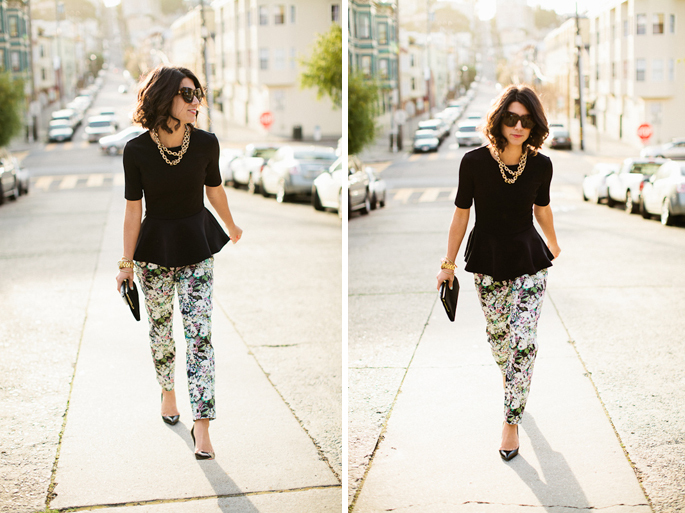 Adore all the elements of this outfit, especially the peplum and the floral print. such beautiful top -the shape is perfect on you. He! I love your style. This is one of my favorites Krystal! I've been trying to track down a necklace similar to yours'. Could you recommend any you've seen? Thanks! Love this look! I'm trying to find floral pants but it's a little difficult when you're pregnant. Krystal - this is sublime! I love how you toned down the print with the black blouse. 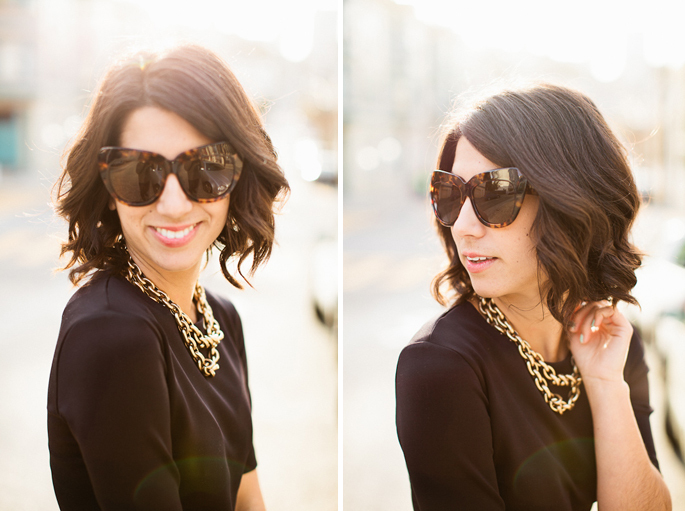 Love these sunnies on you! They frame your face so perfectly! Another gorgeous outfit!! Love the pants and the top! That outfit is totally my style, love it. Beautiful outfit - I especially like the peplum top and necklace. These photos are gorgeous, Krystal! I'm totally inspired to hunt down a peplum top of my own. Love the peplum top and gold necklaces! Nice photos!! These pants are amazing!!! I LOVE this outfit!! You look fabulous! I am so in love with the peplum top! Gorgeous photos, love the glasses! You make me want these pants!! party on top, party on bottom :) I like it. Love the peplum top - and your necklace! The headshots of you are just so beautiful! Love the outfit as well! agreed. the light is divine. and you look fab too! Those pants are made to be FASHION!!! Those pants are so fun! And love them with the pointy toed pumps! Love those pants! They look great =) The whole outfit is sick! ughhhh love the flair of the shirt and the floral pants. Have a necklace similar to that and wear it constantly. Great outfit. I want this outfit! It's bold and elegant!